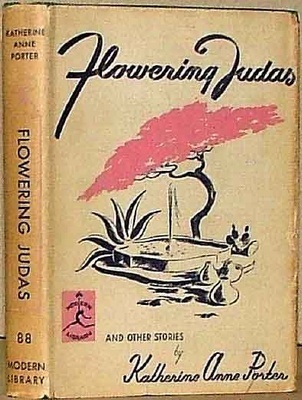 Katherine Anne Porter's first collection of short stories, Flowering Judas, is published September 11th 1930. The title story, which appeared earlier that year in Hound and Horn magazine, cantered on a young American teacher of Indian children whose ideals are compromised. The collection won Porter both critical and popular success and helped her win a Guggenheim Fellowship. Porter was born Callie Porter in Indian Creek, Texas, on May 15, 1890. She grew up in poverty and was raised mostly by her grandmother, whose first name she later adopted. When Porter's grandmother died in 1901, Porter was sent to convent school in New Orleans. At age 16, she married the 27-year-old son of a rancher, but the marriage was a failure. In 1911, Porter left for Chicago, where she worked as a reporter. She later spent two years travelling around Texas as a ballad singer and in 1918 became a reporter for the Rocky Mountain News in Denver. After a grave illness in 1918, Porter moved to Mexico for several years. Her first published work of fiction, the short storyMaria Conception (1922), received almost immediate appreciation from critics. In 1925, she married again but soon divorced. After the publication of Flowering Judas and Other Stories (1930), she moved to Europe and lived in Berlin and Paris from 1931 to 1937. She married and divorced several more times. In 1938, she returned to the United States with her fourth husband and settled in Baton Rouge. In the 1940s, she wrote film scripts and lectured at universities. During her lifetime, she published only 25 stories and one novel, Ship of Fools, which took her more than two decades to complete. She died in 1980 in Maryland.